This week was full of ups and downs in my classroom. There were times when I almost wanted to give up trying to get my students to learn anything and times when I was rejoicing because they wanted to keep reading! Here are my five random things from this week. 1) I FINALLY started to teach pronouns this week. We had been reviewing parts of speech up until now and I'm happy to say we are finally learning the sixth grade language component. This week we focused on subject and object pronouns. We made an anchor chart that they are responsible for memorizing and understanding. 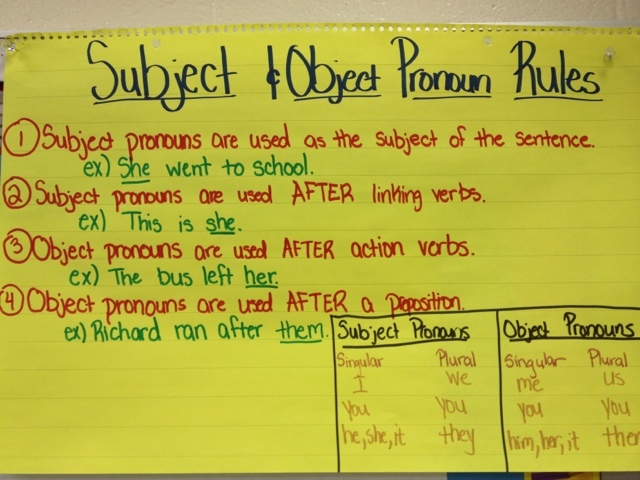 I'm really excited about starting pronouns, but the look on my students faces about making this chart was as if I was speaking another language. 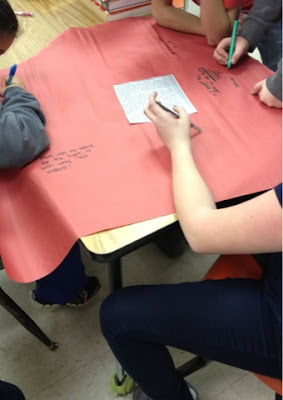 2) After reading some very interesting parts in Where the Red Fern Grows I had my students do discussion posters. I put them into groups of four and taped a page of the story to it that they had to respond to. They also could respond back to their peers which made for some really interesting discussions. 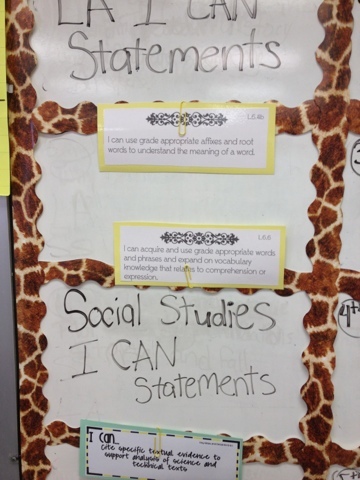 3) I have started to utilize I Can Statements more in my room. I bought some already made I can Statements from TeachersPayTeachers. I laminated them and posted them in my room. I draw a random student to read the I Can Statements for the day/week and then have another student explain how we learned that statement at the end of the day/week. It was great to hear my students actually saying how they learned what I wanted them to learn. I will be doing this as a closure any day that I have a minute or two of extra time. 4) Pencils, Pencils! I have tried almost everything I can think of to get my standard group to keep up with pencils. I've tried buckets on their desk with pencil sharpeners which somehow always seem to get gone. I even try to check them at the end of the class period and students can't find them anywhere! Even when students have a pencil they always are having to have it sharpened. The sharpener on their desk doesn't work somehow so they just have to get up and use one or else they won't have a pencil. It has become ridiculous so I went out and bought a bunch of mechanical pencils. If they need one they have to write their name on the board, erase it and give it back before they can leave class. I'm hoping this will work because pencils are just taking up too much class time. 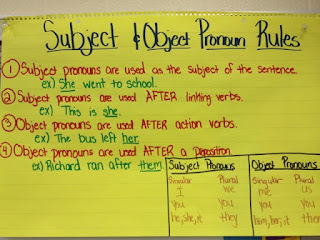 5) One of the rules for object pronouns is that it is used after a preposition. Of course this meant that my students needed to be able to recognize prepositions, so we broke out in song in order to remember them better. For anyone who wants their students to learn prepositions try The Preposition Song by The Bazillions. My students loved it so much they were telling me they posted it on Facebook! Have a listen, it's quite catchy. By the end of the week my students could all name the most common prepositions. I'm so thankful that it is the weekend. I finished my lesson plans yesterday for next week so I'm going to try to think about school as little as possible. My weekend has already been off to a great start with a date to a trampoline park yesterday. After attempting to do flips on a trampoline and still being scared, I gained much more respect for my cheerleaders who are able to tumble on the gym floor. Only three weeks until try outs for next year get started...but why am I thinking about that? I teach 6th grade too and found your blog through Doodle Bugs. I love the idea of using chart paper and part of the book to get student responses. I'm going to try that in the next novel we read. I found you through Doodle Bugs Five for Friday. 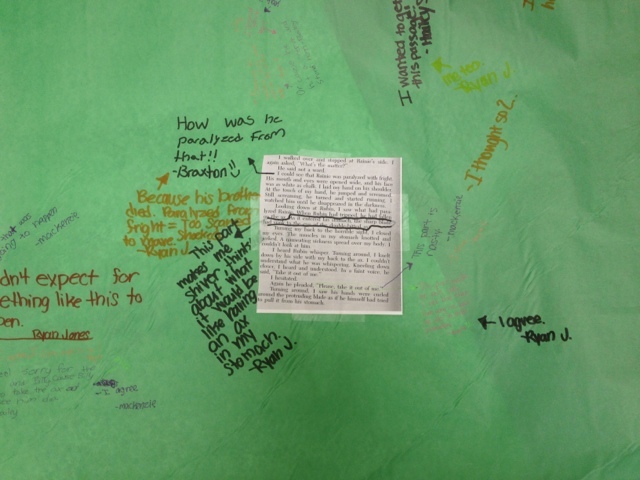 Your idea of using the portion of the book with chart paper for discussion is an awesome idea!! I have such GREAT memories of teaching Where the Red Fern Grows from my elementary teaching days. What a powerful story! And the pencil woes, oh my. I teach 7th & 8th grade and it's still a problem. I just give out pencils all day long. It costs me some cash, but it's not a battle worth fighting to me. I found your blog through the North Carolina state blogs list. I love the idea of the discussion papers. I will definitely be using that idea in my fifth grade classroom. I can also understand your pencil issues. Pencils disappear so quickly in my room that it seems as though my students eat them. Sometimes I wish I could glue the pencil to their hands.